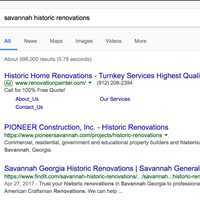 ATLANTA, GA / ACCESSWIRE / October 16, 2018 / Findit, Inc. (OTC PINK: FDIT) a Nevada Corporation continues to provide Savannah Georgia general contractor American Craftsman Renovations their online marketing campaign services for the past 5 years. The overall objective of this ongoing campaign is to help American Craftsman Renovations capture more business online through a strategic online marketing strategy that has increased and improved American Craftsman Renovation's overall online presence in social networking sites and organic indexing in search engines, Google, Yahoo, Bing and Findit. 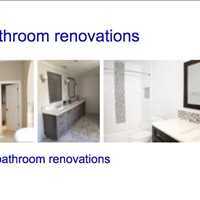 American Craftsman Renovations offers professional home remodeling services across the Greater Savannah Georgia Area. 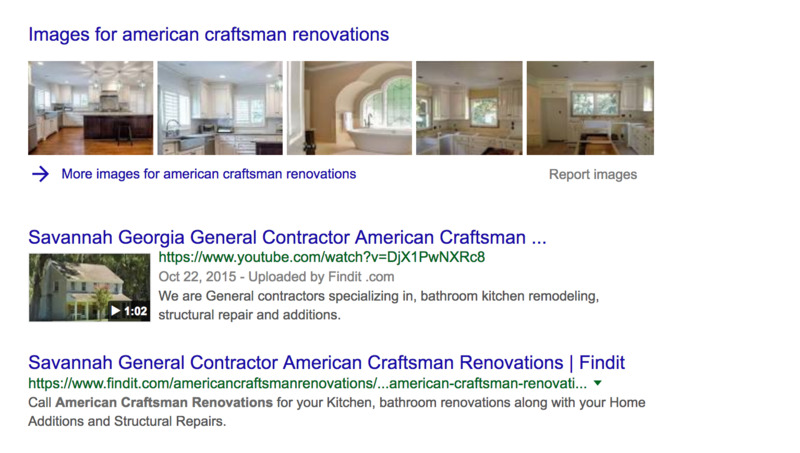 American Craftsman Renovations utilizes Findit to increase their organic search results in Google, Yahoo and Bing and have the content Findit creates for them be seen and shared throughout social networking sites, in addition to Findit that include but are not limited to Facebook (FB), Pinterest, Twitter (TWTR), LinkedIn (MSFT), Google + (GOOG) and Google My Business. Kevin Norris of American Craftsman Renovations stated "We have been using Findit for our online marketing and SEO for over 5 years. As a result we have gotten a lot of jobs that otherwise we may have lost to a competitor. With Findit's ongoing approach to increase our social networking presence and search results under our services areas and the towns that we want to index for in search engines, we have tangible results. The thing we really like about Findit is the exclusivity of running a campaign with them. At a certain budget a competitor cannot hire Findit to do a campaign for them in the same marketplace as us. I'm glad we got to them before one of competitors." American Craftsman Renovations hired Findit to help them improve their overall online presence and brand image through an increase in organic search results found in Google, Yahoo, and Bing. To date we created 20 Findit Sites, which contain their own unique Findit Keyword URL. 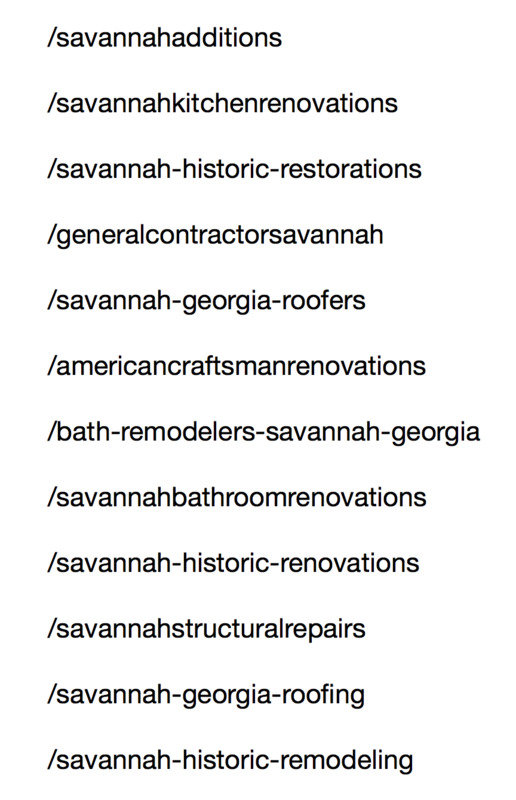 A Findit Keyword URL is an extension of Findit.com, such as www.findit.com/savannahadditions. 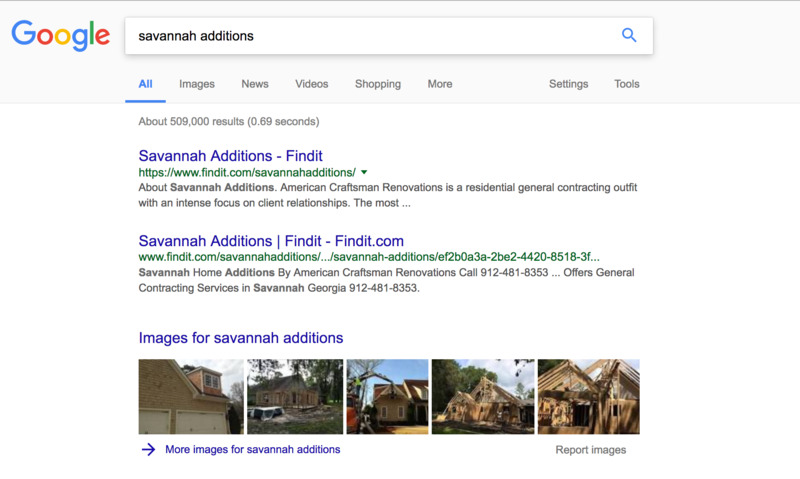 American Craftsman Renovations provided Findit’s marketing team with the towns and services they wanted to index for in search engines. 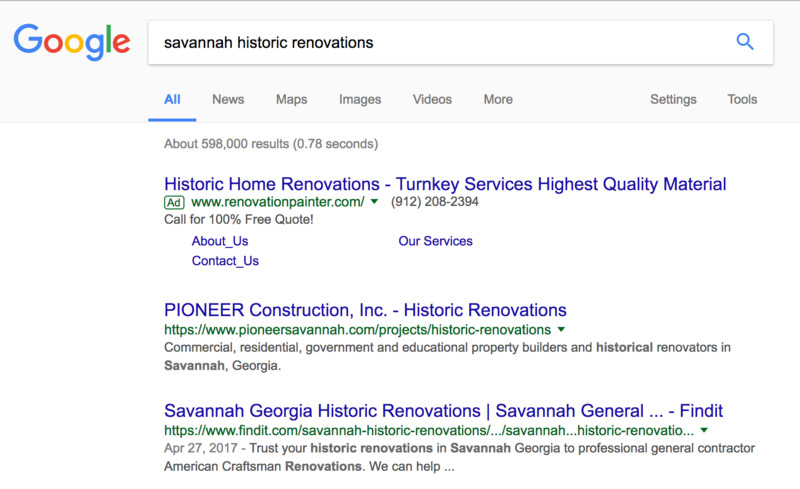 Based on these two targets, the location and the services, Findit came up with the appropriate URLs to create Findit sites for to help American Craftsman Renovations index for these search results. For example, American Craftsman Renovations provides home remodeling services such as kitchen renovations, bathroom renovations, home additions, structural repairs, and roofing services. 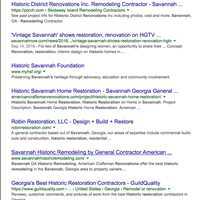 The 20 URLs that American Craftsman Renovations has are all geared towards these services within Savannah and the surrounding areas like Ardsley Park and Ford Plantation Richmond Hill. Each Findit URL that American Craftsman has is its own site within Findit. 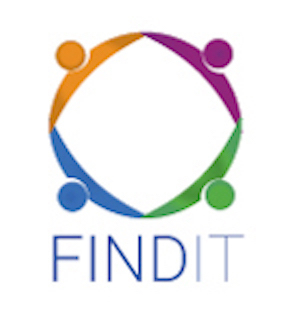 As part of their campaign, Findit sets up a photo gallery for each site that includes photos titled and captioned around the services that they offer, which index in Findit and are crawled by Google, Yahoo, and Bing. Having pictures properly titled increases the likelihood of indexing those images on the first page of Google search results when the title of the picture matches to what the person is searching, all of which leads to more conversions. Once the Findit site is set up within each URL, content is created in the Right Now Feed. The Right Now Feed allows members to post updates that can include unlimited text in the text field, unlimited photos in the photo section, a link to a video, an audio file and a press release. 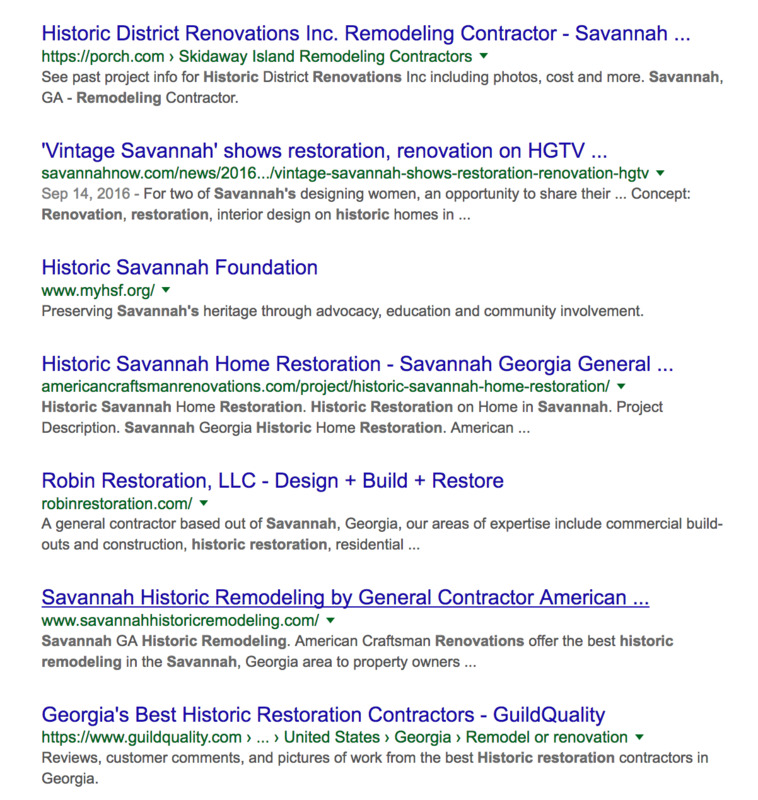 As part of American Craftsman Renovation's marketing campaign, Right Now Posts were created in each of the URLs, targeting the specific service that American Craftsman Renovations offered in the Greater Savannah Area, helping to increase organic search results for the keyword search or searches done in Google that match the content created on Findit. 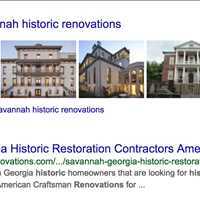 Example: One of American Craftsman Renovation's Findit Sites is www.findit.com/savannahstructuralrepairs. 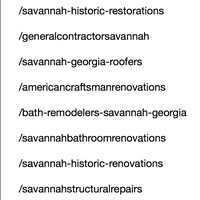 All the photos found within this Findit Site are titled and captioned around structural repairs in Savannah. 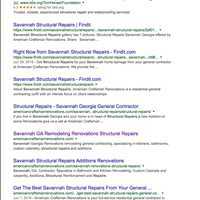 All of the Right Now posts created within this Findit Site are geared around structural repairs in Savannah. 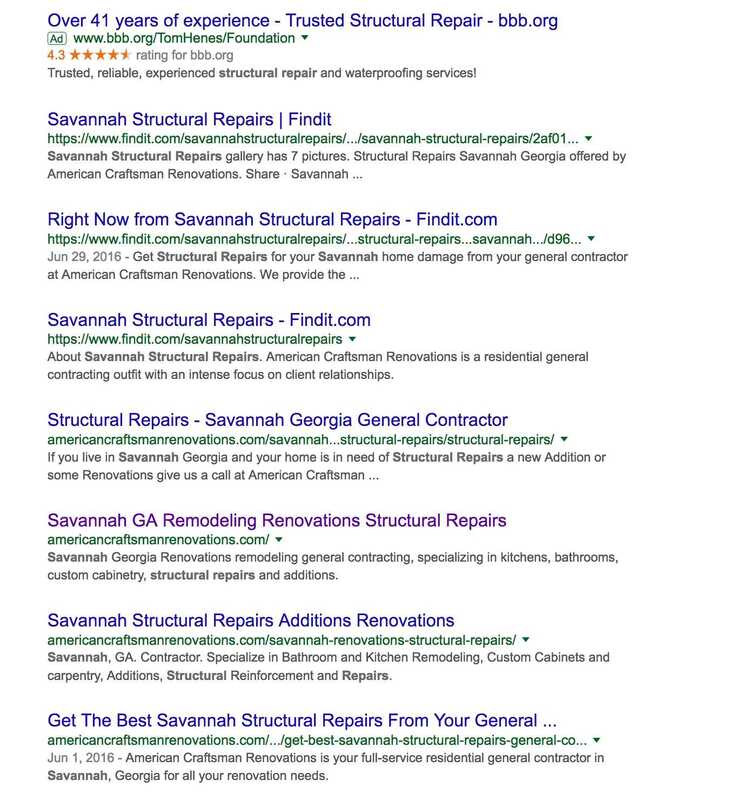 The overall goal of this specific URL is to increase exposure on Findit and in Google, Yahoo, and Bing when the keyword search of 'Savannah structural repairs' or something related to structural repairs in Savannah is searched. 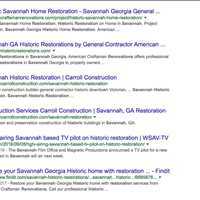 Each URL that was set up has this same goal and the same marketing strategy is done within the other 19 Findit Sites that American Craftsman Renovations has. 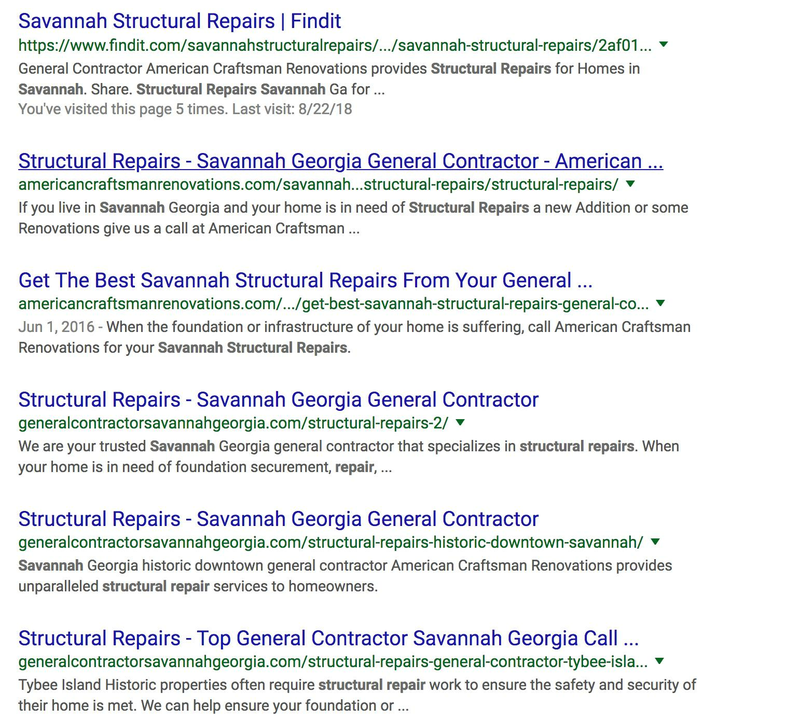 A quick search performed in Google for 'Savannah structural repairs' shows that 8 out of the 9 possible search results are all for American Craftsman Renovations: 1 for Findit.com, 2 for Americancraftsmanrenovations.com, 5 for generalcontractorsavannahgeorgia.com, which is another site for American Craftsman Renovations that we built to be SEO friendly to help improve organic indexing. Moreover, all 5 images that are indexing on page one of Google are all photos that were posted on Findit within American Craftsman Renovation's photo galleries. 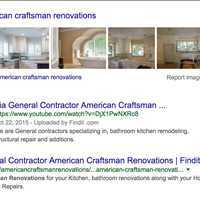 Findit also set up location pages for the 12 locations that American Craftsman Renovations wanted to increase exposure for in search engines. The locations are: Dutch Island, Wilmington Island, Talahi Island, Wylly Island, Tybee Island, Historic Savannah, Savannah, Historic Downtown Savannah, Isle of Hope, The Landings at Skidaway Island, Ardsley Park and Ford Plantation Richmond Hill. 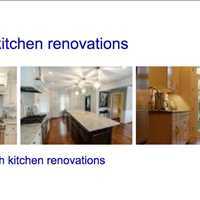 Each location page includes information about the services they provide which are: general contractor services, kitchen remodeling and renovations, bathroom remodeling and renovations, home additions, structural repairs, roofing, window replacement, and historic restorations. These location pages give more information to potential customers about the services that American Craftsman Renovation provides. As a result the relevant content created gives Google, Yahoo, and Bing information to index in their search engines more prominently. In addition to marketing content created on Findit, these status updates and photos are shared to their Facebook Page, which we manage, as well as their Google + account and Google My Business Account. 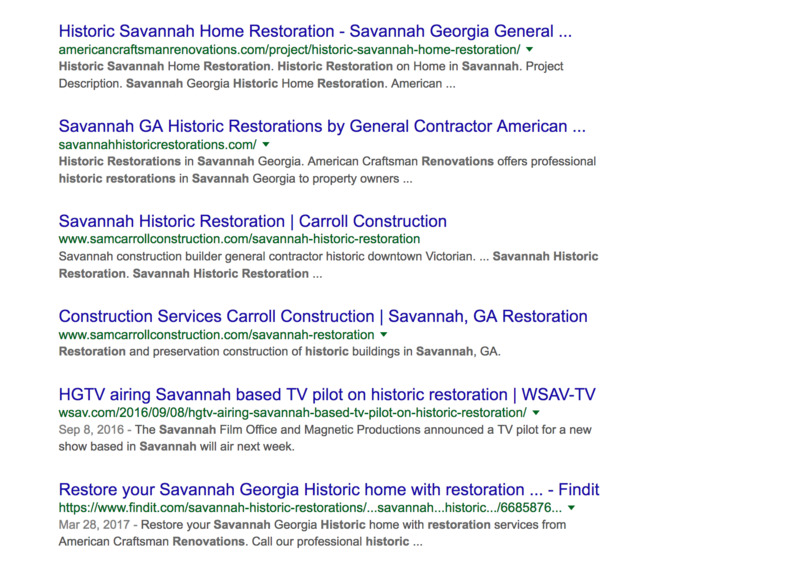 These efforts help increase overall indexing online in search and create more visibility in more places for people who have not yet heard of American Craftsman Renovations. The great thing about Findit is that it is for anyone - anyone that is looking to gain more exposure on the web for the goods or services that they offer or the story they wish to tell. Clark St. Amant of Findit stated, "General contractors globally that offer specific services in specific locations will find that Findit is incredibly valuable to them. Many general contractors are out on the job site all day working and don't have time to handle their own online presence. That's where we come in. General contractors can hire Findit to handle their online marketing campaign and have us create content geared around the services they offer in specific locations, so they start to show up organically in search engines for those keywords. We handle the content and improve their online presence and brand image - they get the calls." All content on Findit can be crawled by Google, Yahoo and Bing and members of Findit as well as visitors to Findit can share content to their own social networking sites. This is a very important distinction from other social networking sites - when you post on closed platforms like Facebook, your content can't be shared outside of Facebook. However, when you post on Findit, you are not limiting who can see your posts and you are not limited to where you can share your posts to. Findit is free to join and members can run their own online marketing campaigns using the Findit social networking content management platform. Outside online marketing firms can also run campaigns for their clients using all of the tools Findit offers. Clients that want to engage Findit can do so. Findit campaigns start at $1,000 per month, on a month to month basis. The minimum campaign includes a minimum of 84 pieces of content that the Findit marketing team creates. Peter Tosto of Findit stated, "When we take on a new client at this price point, we will not take on another client in the same area as you that provides the same service. 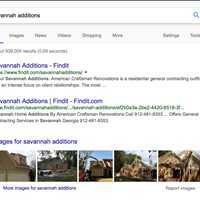 Because American Craftsman Renovations has an ongoing marketing campaign with us in the Greater Savannah Area, Findit will not take on another general contractor to do their marketing on their behalf." To set up your very own marketing campaign with Findit, please call 404-443-3224. American Craftsman Renovations is a residential general contracting outfit with an intense focus on client relationships. The most important thing we build is a life- long relationship with our clients. It begins with our respect of our client's families, homes and the investment that they have chosen to make their homes a functional work of art. In return our clients recognize that we are skilled craftsmen that take pride in our work and appreciate the opportunity given us to provide for our respective families. These basic premises allow for harmonious relationships and beautiful finished work that will last long after a particular project is completed.